From canoes to million dollar yachts, holiday boat parades feature vessels all decked out for the yuletide season. 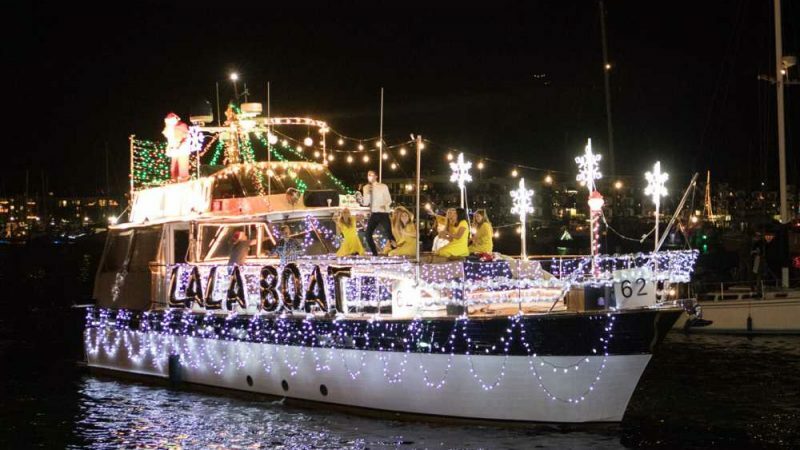 Whether viewing from shore or onboard a vessel, holiday boat parades are a lot of fun. 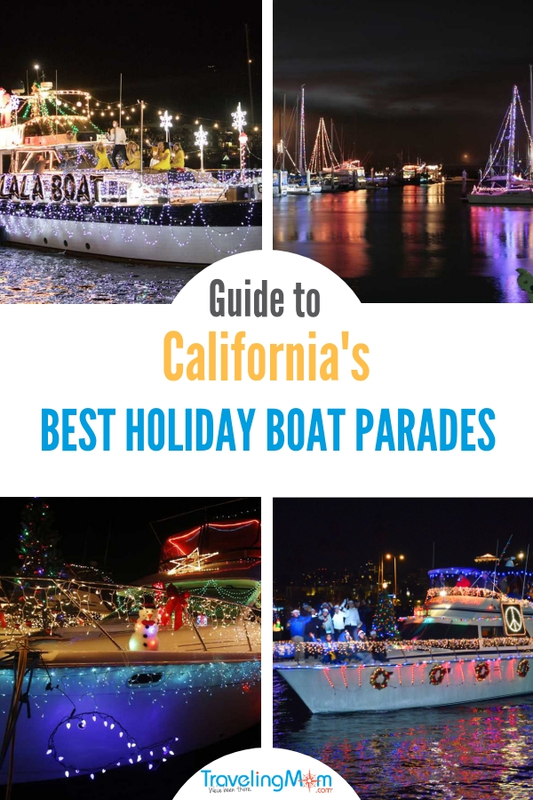 A signature California event, these themed boat parades are a magical way to celebrate the holidays. Fireworks and music round out holiday festivities along the California coast. With miles of coastline and picturesque marinas, it’s no wonder that boat parades are a popular holiday attraction in California. Each year, a new theme inspires boat captains to decorate their boats for a friendly competition. It’s all in good fun. And magical to watch! Elaborate decorations include twinkling lights and decorations, palm trees, inflatable reindeer and Santa. Viewing from shore is free. Or book a cruise on one of the participating parade boats and ride with Santa. The Christmas Boat Parade of Lights features more than 100 boats and yachts decorated with lights. They sail at 6 p.m. Dec. 8 from Quivira Basin. Best viewing is from Crown Point, the east side of Vacation Island or the west side of Fiesta Island. Free. 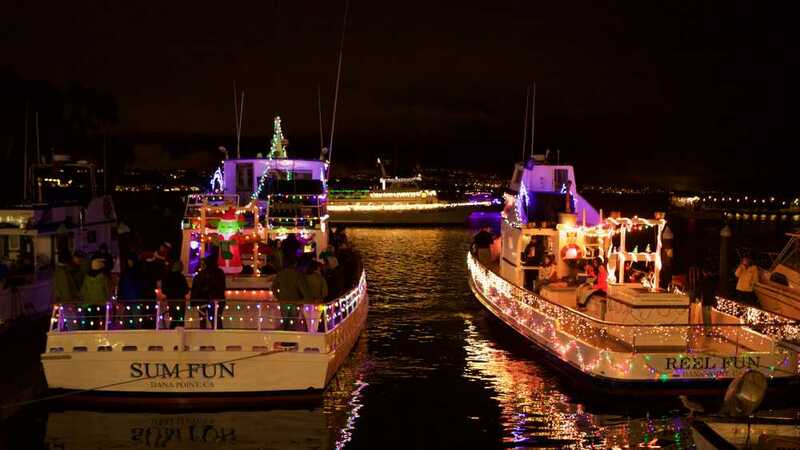 Presented by the Port of San Diego, the 47th Annual San Diego Bay Parade of Lights features more than 100 private boats. The boats are lavishly decorated to fit the theme, Tropical Island Christmas. The parade begins at 5 p.m. Dec. 9 and 16. About 100,000 San Diego residents and visitors are expected to attend, so plan to get there early to secure your viewing spot. This year (for the third time), the parade will proceed to the pier at Cesar Chavez Park. This gives spectators get another chance to view the parade. 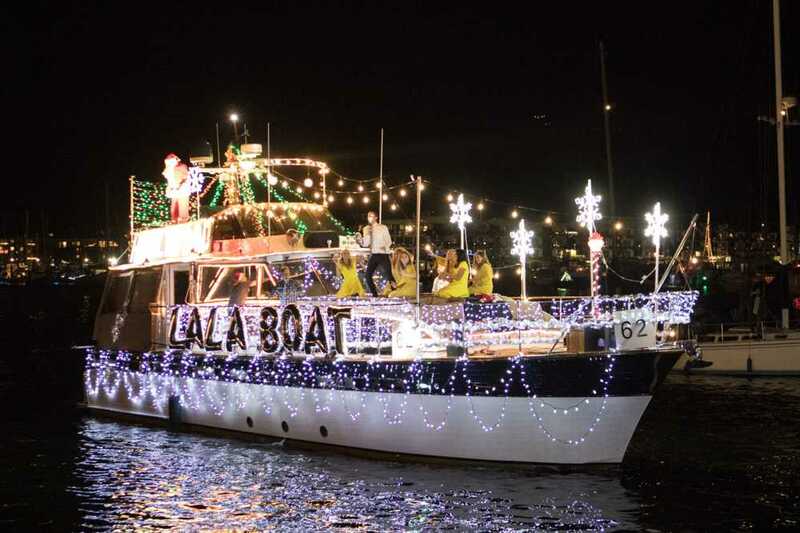 The 43rd Annual Holiday Boat Parade – A Western Wonderland – features about 90 decorated boats vying for awards. The categories include Best Theme, Best Use of Lights, Best Animation, and Most Colorful. 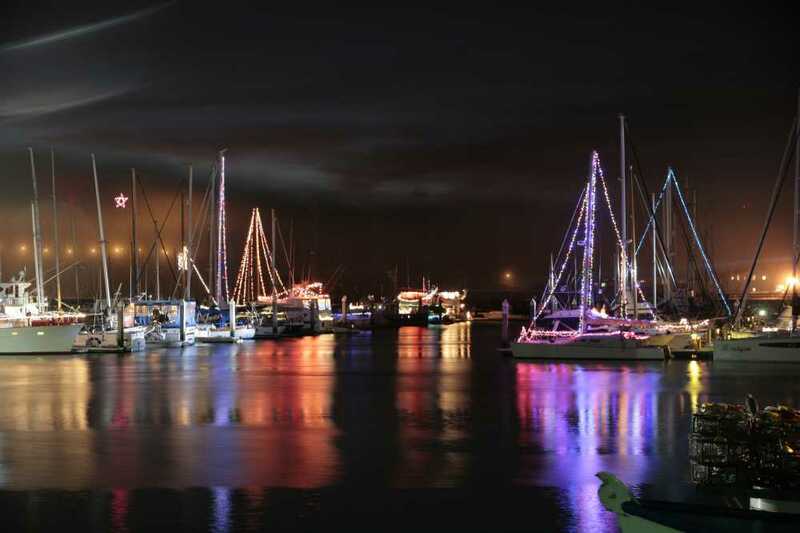 Watch the boats light up the night 7:30 – 9 p.m. Dec. 8, 9, 15 and 16 at the Dana Point Harbor. Find a good spot to watch or join the parade aboard the Dana Wharf Whale Watching cruise boats. $29 adults, $19 Kids 12 & under. Kids under 2 ride free. Onboard, enjoy holiday music, a cash bar and close up views of competing boats. 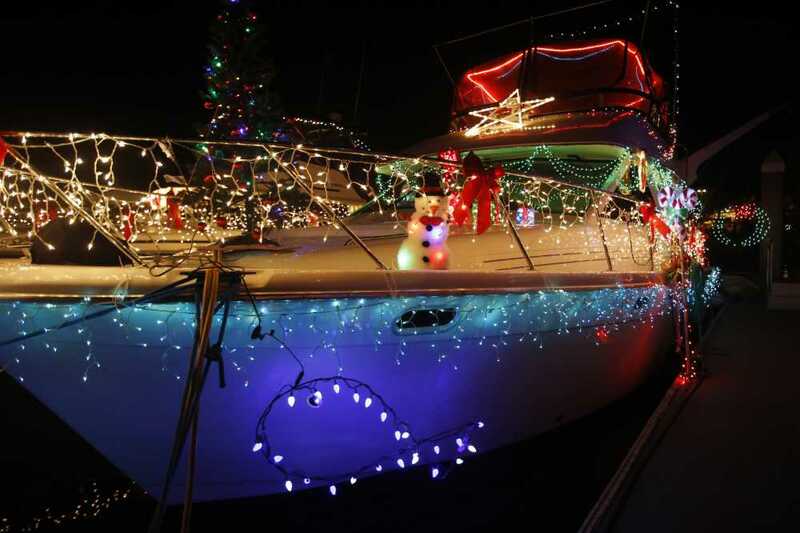 The Snow Wonder family festival marks the start of the 56th Annual Holiday Boat Parade Dec. 8. Themed Winter Water Wonderland, the parade boats cruise through the main channel 6 – 8 p.m. Narration on a PA system is available at Burton Chace Park and Fisherman’s Village. These are the best spots for parade viewing. Arrive early to find parking for this popular event. In addition, Marina Lights glow from 4- 10 p.m. all month long in Burton Chace Park. There’s also free entertainment on Saturdays, nightly all month long, 4-10 p.m., including holiday movies and caroling. The 110th Newport Beach Boat Parade features million dollar yachts, small boats, kayaks and canoes from 6:30 – 9 p.m. Dec. 19 – 23. The parade starts at the east end of Lido Island. The first public viewing destination is at the new 10.5-acre Marina Park. The park offers 177 parking spaces and a nautical-themed playground. In addition, there’s also a picnic area and a sailing center. 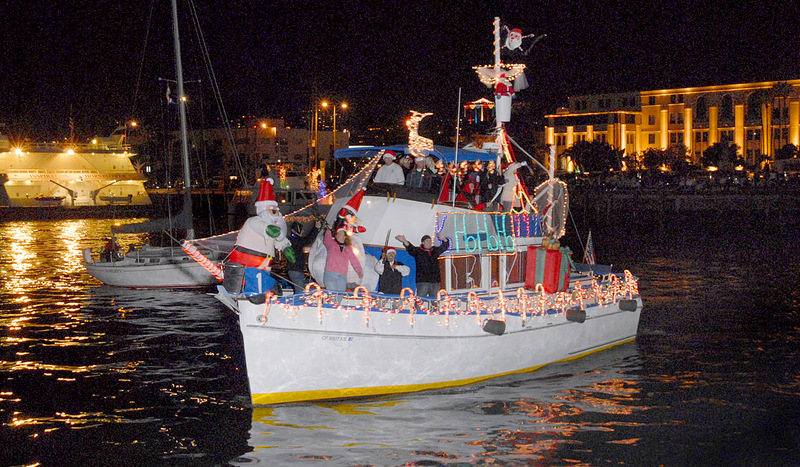 The 35th Annual Venice Canals Holiday Boat Parade parade kicks off at 3:30 p.m., Dec. 9. This laid-back, unique parade starts at the intersection of Eastern Canal and Carroll canals. 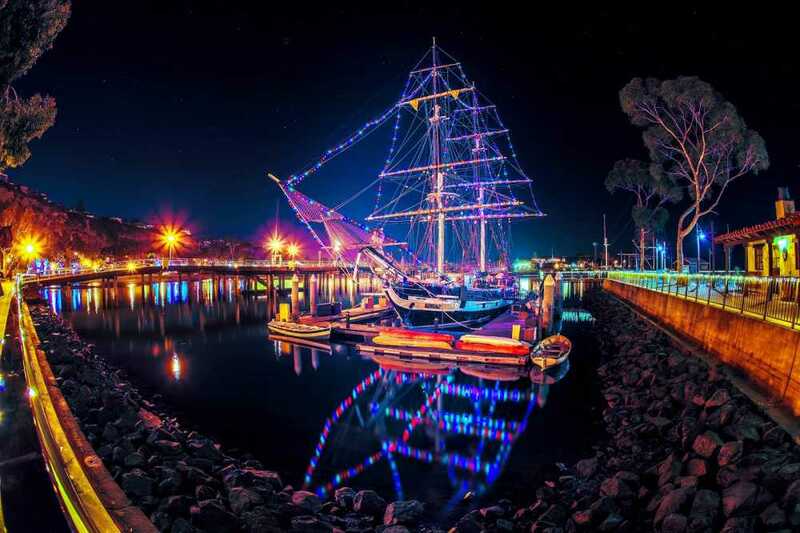 The Pillar Point Harbor Lighted Boat Festival features festively adorned boats throughout December. The boat decorating contest happens at 6 p.m. Dec. 8. At that time, the best-decorated boat will be chosen. Local shops in the Half Moon Bay area will serve holiday snacks and drinks. Santa Claus makes a special appearance along with the Half Moon Bay Choir and San Mateo Elks Band. Half Moon Bay is located about 35 minutes south of San Francisco.